Will my weight change after surgery? The tumor blocks off part of the GI tract, making it difficult for food to pass through. A decreased appetite may be a symptom of gastric cancer itself. After surgery, what is left of the stomach is much smaller. This means a smaller amount of food is able to fill it up. So, patients can feel full, even though they might not have eaten enough food to give their body energy and maintain their weight. Dumping Syndrome – food moves through the stomach and small intestine very quickly. Nutrients are not absorbed and the patients can quickly lose weight (Canadian Cancer Society). What can I eat? How will this change around the time of my surgery? When your doctor says so, you can begin following a soft food diet. This resource has a lot of helpful information about about what to eat following a gastrectomy. There is no standard diet plan for all patients to follow after surgery. The guidelines above are very generalized. Each patient should follow the advice of their own doctor and nutritional support team. It is easy to become deficient in certain key vitamins such as B12, and folate, as well as calcium and iron. Your body needs these ingredients to keep up many of its regular functions, so it could be a good idea to take vitamin supplements (Canadian Cancer Society). Tube feeding: What is it, and can it help? If a patient cannot chew and swallow food (known as dysphagia), they may be fed enterally. Enteral nutrition (often referred to as tube feeding) uses a flexible tube to deliver nutritionally-rich fluid directly to the GI tract while bypassing the mouth. This is done to make sure patients are still absorbing enough calories, vitamins and nutrients even when they are unable to eat normally. Nasoenteral nutrition – a feeding tube is passed through the nose to the esophagus and directly into the stomach. Nutritional fluid can be delivered to the stomach through the tube. This is typically only used immediately following surgery. This is a longer-term solution to enteral nutrition after gastrectomy (compared to a nasoenteral tube). 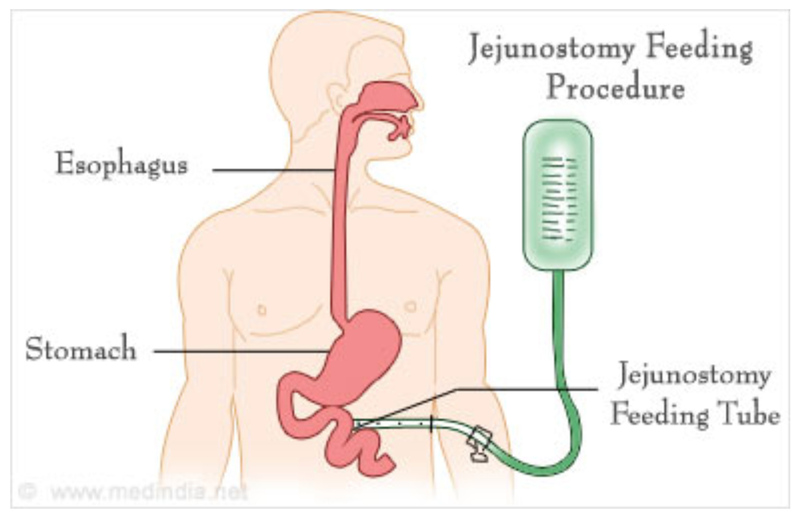 They gave one group of patients a jejunostomy tube and overnight fluid feeding through an electronic pumping device. This means that every night while the patients slept, the device put a certain amount of nutritionally-supplemented fluid right into their jejunum. This group of patients lost less weight overall than the control group, who was receiving standard care. Using a feeding tube can be a viable way for cancer patients to maintain their nutrition and quality of life following surgery. Enteral nutrition is used when patients cannot eat normally through the mouth, but their GI tract is not damaged. Parenteral nutrition inserts a catheter tube into the patient’s vein, and delivers a nutrient-rich fluid into their bloodstream. However, parenteral nutrition is also associated with a higher chance of infection from inserting and maintaining the catheter.⁵ So, it is only recommended when patients are unable to tolerate oral or enteral nutrition. What can be done before surgery? Preoperative nutrition refers to what you’re eating and drinking before surgery. One specific type of preoperative nutrition is called Immunonutrition. Immunonutrition supplements patients’ diets with ingredients which help to specifically boost the immune system. Some studies have shown that immunonutrition before surgery can increase the number of working immune cells in our body. It may also minimize complications and the length of hospital stay after surgery. Enteral nutrition can be given within 6-12 hours of surgery. Anemia (low iron in the blood) and Vitamin B12 deficiency are some of the most common nutritional symptoms related to gastric cancer surgery. Chemotherapy causes side effects such as nausea, vomiting, diarrhea or constipation. Cancerous cells are impairing the absorption of nutrients and other GI functions. All of these situations can lead to malnutrition and weight loss. If oral (eating normally) or enteral nutrition are not helpful, patients may use home parenteral nutrition (see above) instead. So, it is extremely important to follow the recommended diet suggested by your physician! What is the Elemental Diet? An elemental diet is a supplement which provides nutrients in the simplest form possible. This means the GI tract has to do a lot less work to break down the food you eat. It makes digestion and absorption much easier! The elemental diet often comes as a drink which is very high in calories and nutrients. It may be prescribed when a patient is unable to eat and absorb enough food to maintain their nutrition. This research was done to address the common problem of weight loss after surgery. The elemental diet gives extra calories in a way that is easy for patients to digest, so there is a smaller chance that their bodies are underfed. These results look promising, but more research is still needed before the elemental diet is used as standard treatment for patients after gastrectomy. How can we test for malnutrition? Nausea and vomiting – may indicate dumping syndrome or gastric stasis (which is when foodstuffs do not “move along” the GI tract like they are supposed to). Many different tests can be done to find out what the problem is and how it can be fixed by altering your diet. Gastric Emptying is the ability of the stomach to release foodstuffs to the small intestine. Dumping Syndrome: food passes too quickly from the stomach into the small intestine. Normally, food spends some time being broken into small pieces by the blender-like muscles of the stomach. When this process does not occur properly, much larger pieces of food enter the small intestine. More research is needed to find out what the best diet to follow for dumping syndrome management is. Although, eating small amounts of liquid/pureed foods throughout the day is easier on the GI tract and may help with some symptoms. Diagnosing fat malabsorption involves collecting a stool (feces) sample, and testing the amount of fat it contains. This symptom can be treated by giving lipase. Lipase is an enzyme made by the pancreas which helps to break down fat. Bowrey, D.J. et al. A randomised controlled trial of six weeks of home enteral nutrition versus standard care after oesophagectomy or total gastrectomy for cancer: report on a pilot and feasibility study. Trials (Springer Nature). 2015. 16:531. Available from: doi: 10.1186/s13063-015-1053-y. Gavazzi, C. et al. Importance of early nutritional screening in patients with gastric cancer. British Journal of Nutrition. 2011. 106:(1773-1778). Available from: doi: https://doi.org/10.1017/S0007114511002509. Hiroshi, I. et al. Effects of an oral elemental nutritional supplement on post-gastrectomy body weight loss in gastric cancer patients: a randomized controlled clinical trial. Annals of Surgical Oncology. 2016. 23:9(2928-2935). Available from: doi: https://doi.org/10.1245/s10434-016-5221-4 . Rogers, Christie. Postgastrectomy nutrition. Nutrition in Clinical Practice. 2011. 26:2(126-136). Available from: doi: 10.1177/0884533611400070. Rosania, R. et al. Nutrition in patients with gastric cancer: an update. Gastrointestinal Tumors. 2016. 2(178-187). Available from: doi: 10.1159/000445188. Yu, O. et al. Effectiveness of postoperative elemental diet (Elental©) in elderly patients after gastrectomy. World Journal of Surgical Oncology. 2016. 14;(268). Available from: doi: 10.1186/s12957-016-1013-3.